Now that we are back at work after a quick jaunt to the Palm Spring area it is time to play catch on all the news and offers that have been released since last Friday. One that you may have seen hit many of frequent flyer/points blogs or in your email if you are an Aeroplan member, is this one that we bring to you today for some Free Aeroplan miles. What type of miles are best? Free Miles of course! 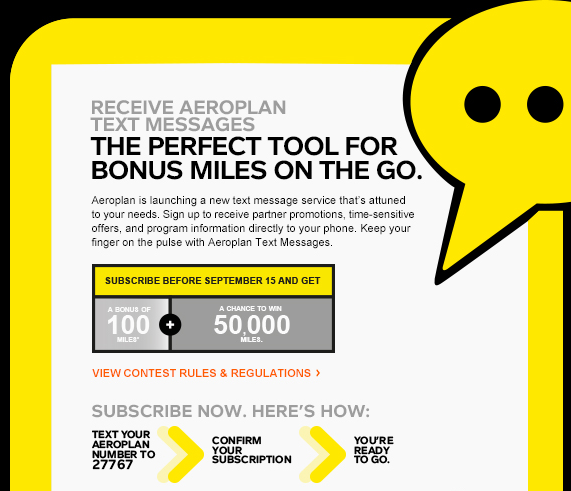 Earn 100 Aeroplan Miles when you subscribe to Aeroplan Text Messages. 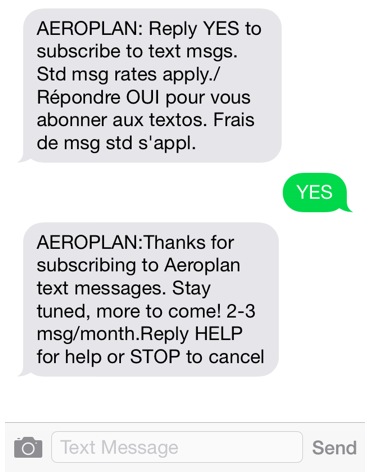 Simply text your Aeroplan number to 27767 and confirm your subscription by September 15th to earn the miles. You will also be entered for a chance to win 50,000 Aeroplan miles. Screen shot taken from my phone showing the easy process!